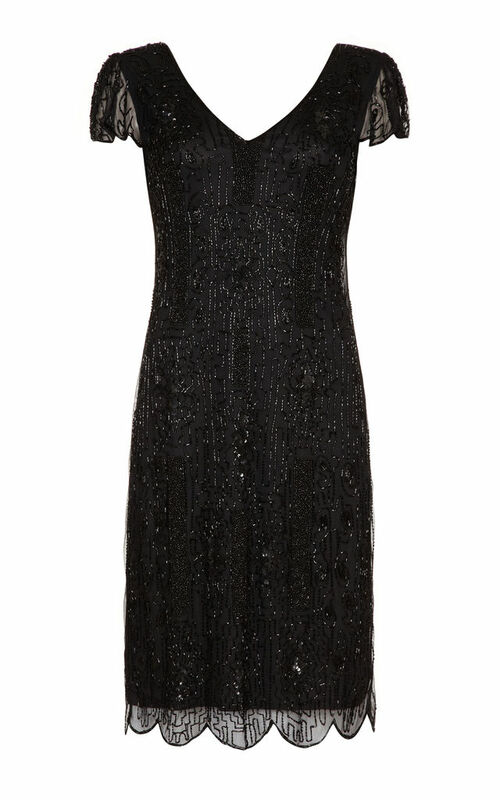 The upgraded Downton Abbey Flapper dress in black is now embellished with sparkling sequins and beads that shimmers up like fairy lights from all angle's. This amazing dress is simply a stunning reproduction of the 1920’s Vintage Inspired Flapper! Completely handmade like all our garments with allover embellishment. Dazzled with glass beads and gorgeous sequined patterns throughout and beyond this plunging V neckline. Due to the stretchy mesh, sizing is very flexible like if your in-between sizes we suggest you go down half a size. Please note - All pictures and video were shot in studio with studio lighting therefore the actual colour of the garment may vary due to the nature of the garments reaction to light. Please feel free to contact us for further information. size UK4 EU32: Bust 31/32" Waist 27/28" Hips 35/36" Length 39"
size UK6 EU34: Bust 32/33" Waist 28/29" Hips 36/37" Length 39"
size UK8 EU36: Bust 33/35" Waist 29/30" Hips 37/38" Length 39"
size UK10 EU38: Bust 35/37" Waist 31/33" Hips 39/41" Length 40"
size UK12 EU40: Bust 37/39" Waist 33/35" Hips 41/43" Length 40"
size UK14 EU42: Bust 39/41" Waist 35/37" Hips 43/45" Length 40"
size UK16 EU44: Bust 41/43" Waist 37/39" Hips 45/47" Length 41"
size UK18 EU46: Bust 43/45" Waist 42/44" Hips 49/51" Length 41"
size UK20 EU48: Bust 45/47" Waist 44/46" Hips 51/53"Length 42"
size UK22 EU50: Bust 47/49" Waist 46/48" Hips 53/55" Length 42"
size UK24 EU52: Bust 49/51" Waist 48/50" Hips 55/57" Length 42"
size UK26 EU54: Bust 51/53" Waist 50/52" Hips 57/59" Length 42"
size UK28 EU56: Bust 53/55" Waist 52/54" Hips 59/61" Length 42"
size UK30 EU58: Bust 55/57" Waist 54/56" Hips 61/63" Length 42"